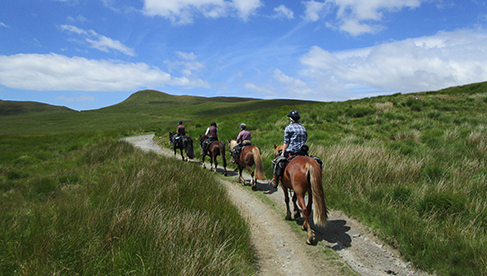 Freerein trail riding in Wales offers self-guided trail riding holidays in Wales in the United Kingdom. Ride from two to seven days on days and dates to suit you. 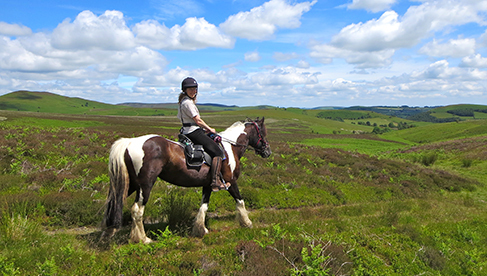 Freerein Riding Holidays makes all arrangements, and you get the freedom and independence of taking off on your own on a horseback riding vacation. There aren't many places that offer this option! 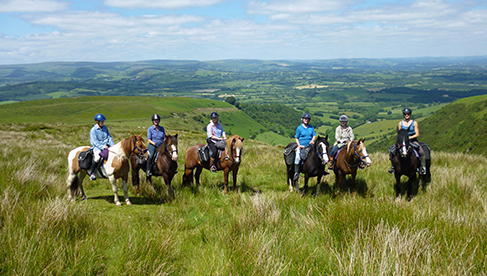 Freerein also offers learn to ride holidays and guided riding tours, for those who would like a bit more guidance. 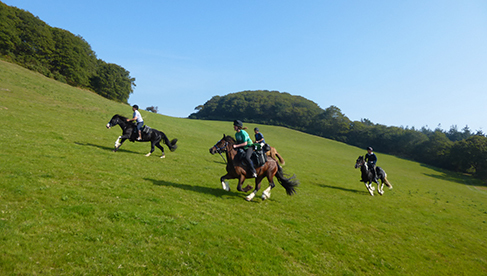 Freerein Riding Holidays has a herd of fit, friendly and forward going trail riding horses and a network of thirty overnight trail stops at farms and inns across Wales from border to coast, including beach riding. 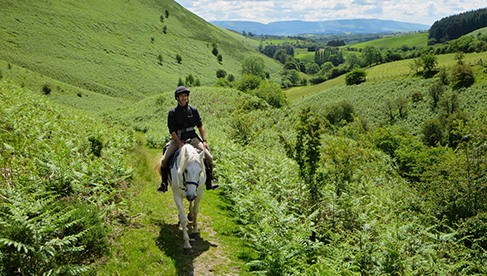 There are lots of riding vacation choices on these Wales treks. 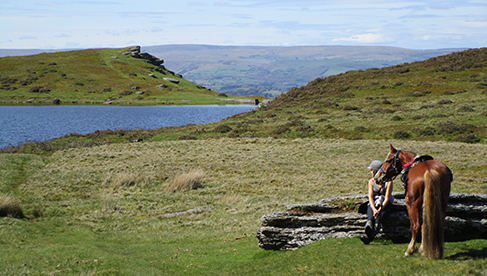 Ride the beautiful Brecon Beacons National Park in Wales, where Equitrekking was filmed! Discover stunning hills and mountains riding from Welsh/English Border in the Wye Valley to the beaches of the Dovey Estuary on Cardigan Bay. Explore the Radnor Hills and spend nights at two country guest houses - The Old Rectory, Cwmfillo or New House on the first night then onto Bettws or Glanoer on the second. Enjoy picnic lunches and stop for lunch at the pub on your trail riding vacation! For competent riders wishing to explore the hills without a guide. Start and finish any days and dates. These inn to inn riding vacations take you to cozy, small inns and B&B accommodations with a truly "local" feel to get the most of your Wales horseback riding adventure. 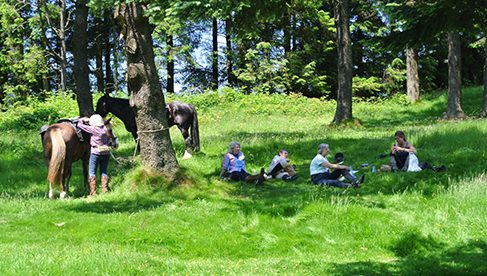 For riders wishing to join a sociable group led by a guide, on set dates throughout the season. 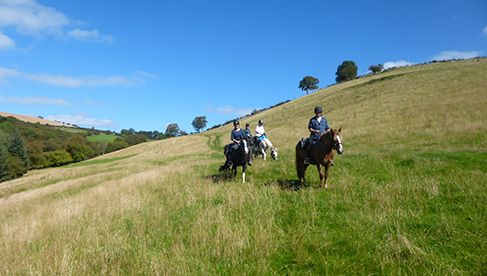 For adult beginners seeking friendly guidance in riding and looking after a horse in the hills. 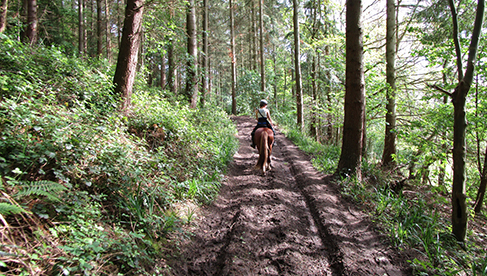 Learn to Ride Holidays are adult 3 day courses designed to help you gain new riding skills and trail riding confidence. For these learn to ride trails, riders stays at welcoming country inns and enjoy a three day introduction to riding in the hills, tracks and trails. You don't need any experience to participate. You will learn to prepare your horse for the trail – catch, feed, groom and tack up. Suitable for complete beginners and novices upwards. 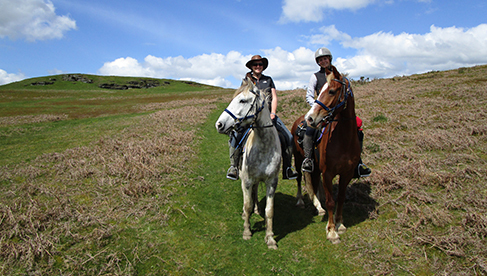 By the end of an Onto the Trail course, many riders will have gained the confidence and skills to enjoy a Self Guided Freerein trail riding vacation or to join one of the many guided rides available worldwide or at home. Your own guide just for you and your party, start and finish any days and dates. 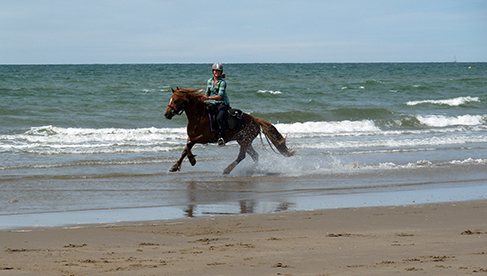 Unique self-guided and guided trail riding holidays in Wales, adult 3 day learn to ride trail riding vacations and more. Suitable for complete beginners and novices upwards. All styles and levels welcome! 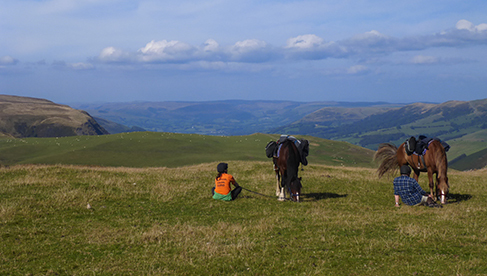 Learn more and get a quote on a riding holiday with FreeRein Riding Holidays.